This issue sees a familiar Perez approach to story telling as we see a combination of real time events and flashbacks, merging into each other seamlessly. After the euphoria of the recent triumphant arrival of the Amazons in Man’s World, Diana suddenly finds herself isolated and alone – on the periphery of events while at the same time having to distance herself from her friends in the outside world. Suddenly we see a rare side of the Amazon Princess – a young, vulnerable woman with the same sensibilities as the rest of us. On the campus of Harvard University Vanessa and Eileen are making their way towards the main building. Vanessa moans about how her mother has chosen a Saturday to ask her to bring over some papers the professor had left at home. Eileen says nothing as they make their way inside and they ask the receptionist where they should leave the satchel of papers. He indicates that Julia is in the main library and they walk down the corridor. As Vanessa opens the door to the library though she is surprised to see her mother together with all of her friends waiting for her, standing under a banner which reads “Happy Birthday Vanessa!”. Eileen smiles and wishes her friend an early happy birthday while her other friends rush over to greet her. They tell the stunned Vanessa that Eileen had planned everything, making the party five days early so as not to raise any suspicions. Julia hugs her daughter and apologises for the subterfuge but adds that it would not have been much of a surprise otherwise! Vanessa mingles with her friends although still seemingly slightly subdued and Joanne Ridings sarcastically mentions that she has noticed that Wonder Woman is not here. Eileen growls “watch it Ridings” but Joanne continues unabated, saying that maybe Vanessa’s so called close friend was just too busy. As Eileen again warns the girl to back off, an agitated Vanessa rushes over to her mother, asking where Diana is. Julia tells her to calm down and says that the Amazon Princess is simply running a little late. 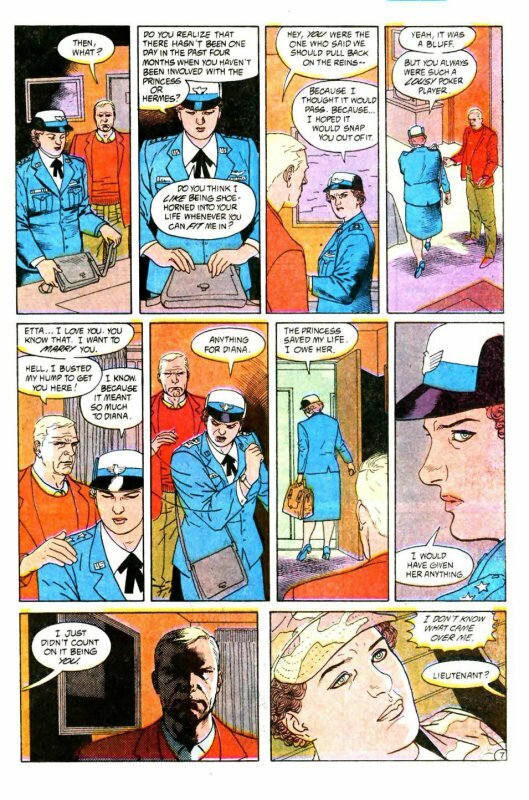 Vanessa becomes highly anxious though and remarks that Diana is never late for anything…unless something has happened to her! Joanne tells her to chill out saying it is no big deal. Maybe the “Princess” has more important things to do than come to a stupid birthday party! On hearing this, Vanessa snaps and launches herself at Joanne. The two girls fall to the floor in a scuffle as the other stunned guests look on! Meanwhile high up over the ocean Lt. Etta Candy sits inside the cargo compartment of a military transport plane on her way to Saudi Arabia. She stares into space as she thinks back to recent events. She had left Steve a message on his answering machine, saying that she hoped he was not simply refusing to pick up the phone although she would not blame him for doing so. She had told him how sorry she was for what had happened the other night in New York. As her mind drifts back to that night, she remembers how Steve had returned to their hotel room to find her getting dressed into her uniform. Confused, he had asked her why she was getting ready to depart when she still had a week’s leave left? She had icily replied that if she was going to spend the week alone, she may as well spend it back in Massachusetts! He had replied that Diana had needed him and Etta snapped back that she knew full well what Diana needed – “You don’t forget the thing that gets your lover out of a hotel bed at three in the morning!” She had then pointed to her watch and added that he had been gone for over nineteen hours! Steve had apologised and Etta asked him what it was about Diana that made him forget about everything and everyone around him? What hold does the Amazon have over him? He had scowled and asked Etta whether she was implying there was something more to his relationship with Diana than just friendship. She in turn had snapped back “No!” and he had demanded to know what it was that was bothering her then? Etta had replied that there had not been one day in the past four months when Steve had not been involved with either Diana or Hermes. Did he think she enjoyed being shoe-horned into his life whenever he could fit her in? Steve had responded by saying that it was Etta who had suggested they “pull back on the reins” of their relationship. Etta had nodded and said that she thought it would pass and that their “break” would serve as a wake up call for Steve. In other words – she had been bluffing! Steve had then placed a gentle hand on her shoulder and told her that he loved her and wanted to marry her – he had even gone out of his way to ensure Etta had been granted leave to come to New York with him. Etta had replied that he had only done it for Diana, because he knew how much it meant to the Amazon Princess. “Anything for Diana!”. 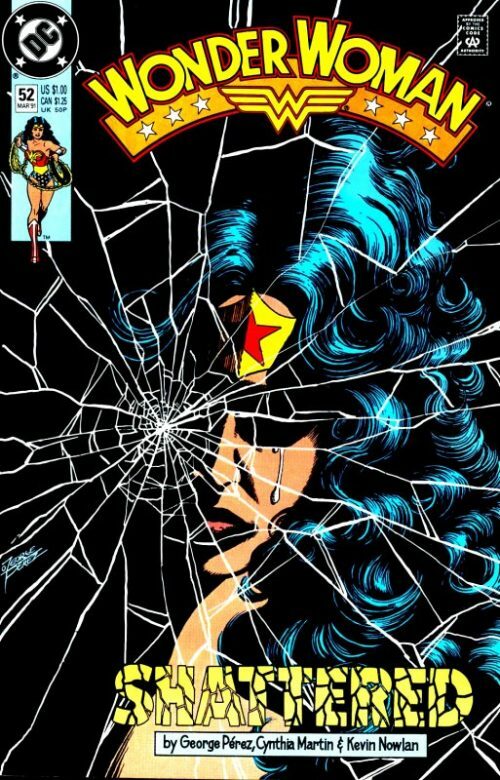 Pulling away from Steve sharply, Etta had then headed for the door and told him that as Wonder Woman had saved her life, she owed the Princess and would have given her anything. She just had not counted on it being Steve! She had then left the hotel room while a pensive Steve watched her go, saying nothing. A few days later, once she had cooled down she had tried to phone Steve to smooth things over but only got his answering machine. She had tried to put her actions down to her feeling so confused and angry with him that night in New York. She had not even realised until afterwards that Steve had actually proposed to her! She had then continued sarcastically to say that she had perhaps considered it improper to commit bigamy, seeing as he was already wedded to Hermes! She had instantly regretted her childishness and quickly apologised. Frustrated that she could not actually speak to Steve instead of just leaving him a message, she had told him that she loved him and that she would make it all up to him once she returned from Saudi Arabia. “And if that offer still stands…about marriage I mean…I” At that moment the tape had run out. Meanwhile back at Vanessa’s party Diana arrives to find the celebrations have come to an abrupt end. She asks whether she is really that late and is told that Vanessa had gone berserk and attacked another girl, although they were not sure exactly what had sparked the tussle. As Eileen listens nearby to the conversation, Diana is told how the fight had something to do with her – it seemed that Vanessa was scared something had happened to the Amazon. On hearing this, Eileen runs out of the library and Diana makes her excuses to follow the young girl. Eileen had happily introduced the rest of her family to Diana and cordially shown her around her house. She had then asked what she could do for the Amazon Princess. Diana explained that Julia had told her how Eileen was arranging a surprise birthday party for Vanessa. She had offered to help Eileen but the young girl had scowled, saying how it was supposed to be a secret and that she was afraid Diana might find out about it. Puzzled, Diana had asked why Eileen would not want her included in the secret. Eileen had bluntly told Diana that it was because she was not invited. She had then explained to the surprised and confused Amazon Princess that it was nothing personal. It was just that it was supposed to be Vanessa’s special day and she did not want anything to ruin it for her friend. Diana had asked how she would ruin it and Eileen had said “Just by being there.” With Diana at the party who would pay attention to Vanessa? She had then added that she did not want to hurt Diana’s feelings, but just wanted Vanessa to know that she is loved just because of who she is…not Diana. As Eileen now ponders whether to open the storeroom door, Diana says that she has not come to the party as an act of defiance. She thought Julia had explained to Eileen their arrangement of having Diana arrive later so as to give Vanessa time in the spotlight? The young girl responds that Julia had, but Eileen had still not liked the idea. In the end though it seems that neither of their approaches had worked. As Eileen at last opens the door to Diana, she tells the Amazon that they both have “crummy ways” of showing how much they love Vanessa; she by telling Diana not to come to the party; and Diana by arriving late. “Some friends we are.” she murmurs. As the weeks pass a troubled Vanessa continues to suffer from horrible nightmares. She dreams she is a little girl lost in a dark corridor. She calls out to her parents and to Diana. Suddenly she hears people singing “Happy Birthday” to her and she sees her mother standing over a coffin shaped cake! Julia asks her to blow out the candles and the tiny Vanessa asks her mother where her father is? Darkness swirls about her as Julia smiles and says that he is simply “a little late”. She then urges Vanessa to blow out the candles and as she does so, the coffin lid opens revealing the skeletal remains of her dead father, who proceeds to wish her happy birthday and say how he would never miss his own daughter’s party! In the office of Vanessa’s psychologist, Julia listens stunned as Dr. Charles Stanton tells her how her daughter has been suffering from such nightmares for some time. But this most recent dream only goes to validate his previous prognosis. Vanessa may have no chance of recovery – no reasonable expectation for a secure, natural childhood – as long as Wonder Woman is in her life. He understands how much the Princess means to Julia and Vanessa, but her daughter’s psyche cannot survive much more of her obsessive dread with Diana’s well being. The recent incident at the party had simply taken Vanessa back to the first time she felt deep loss and betrayal – on her fifth birthday…the day she learned of the death of her father. Vanessa had remembered how Julia had lied to her about his death and had not said anything until after the party was over. 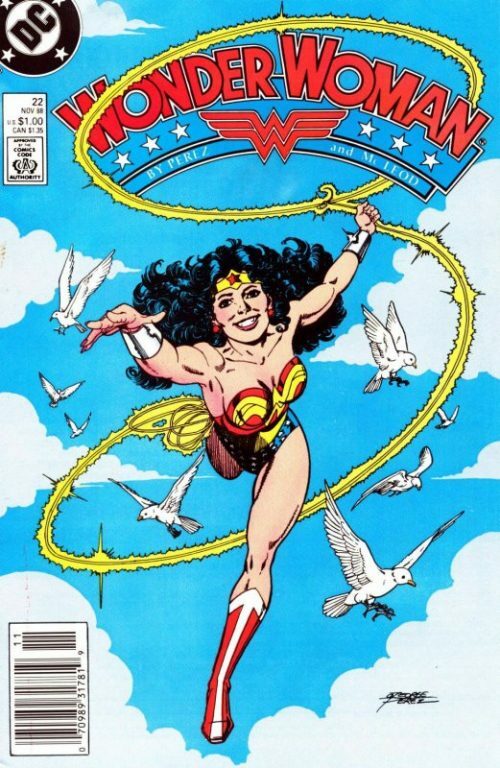 “At the time it was the most difficult sacrifice I have ever performed for my daughter…until now” she tells Wonder Woman a few days later. Julia says how she has been agonizing about this decision for days since speaking with the counselor and prays for the Amazon’s forgiveness. Wonder Woman tells her friend that she understands completely and that there is nothing to forgive. Julia is only doing what is best for her daughter. She then says how sorry she is for bringing Julia and Vanessa such pain. As Julia tries to interject, Wonder Woman continues that Julia should not let their friendship supercede her maternal duty. What she is doing is the right thing for her daughter. 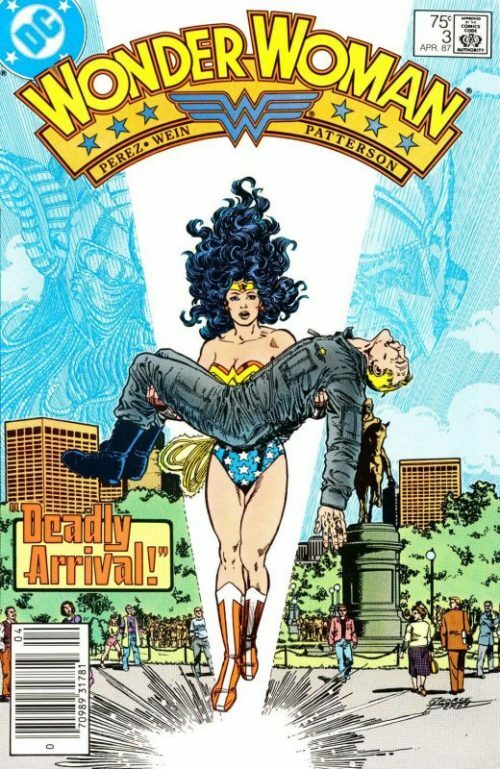 A short while later Wonder Woman arrives at the home of Steve Trevor. However, he reluctantly tells her that he must put some distance between them while he sorts out his problems with Etta. Wonder Woman apologises for having called him that evening back in New York and had never meant to cause any trouble between him and Etta. He tells her that she had been worried about Hermes at the time and understood why she had called. The Amazon nods and says that when last she spoke to the God, she had sensed such resentment in his voice. “I’ve been getting a lot of that lately” – and now it appears has compromised Steve’s relationship with Etta too. Steve tells her that he is a big boy and the decisions he had made had all been his. Lately though, he feels he is losing control of both his professional life and his love life. He tells Diana that Etta is currently somewhere in the Persian Gulf and he was not even there to wave her off goodbye. A saddened Wonder Woman asks him if there is anything she can do but he shakes his head, saying this is something he must sort out on his own. He needs to take charge of his own life again while he still can. He reassures her that it will not be forever and once this all blows over it will be just like old times between him and Diana – “like brother and sister again”. Next she visits her mother and the other Amazons staying at the Waldorf Astoria. 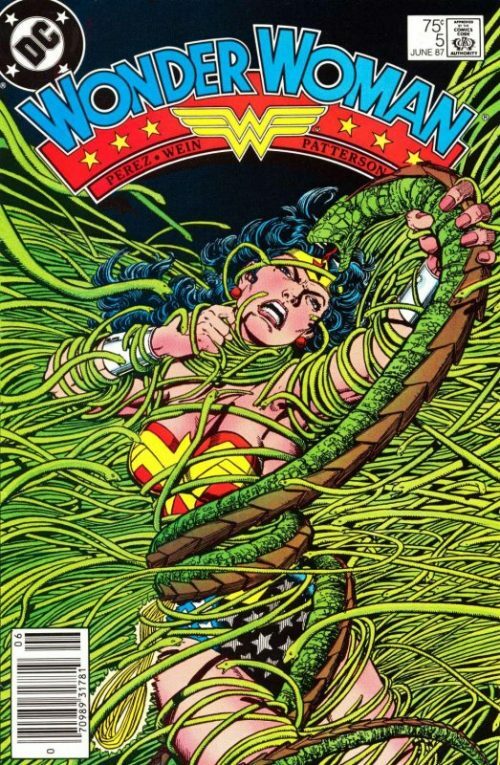 As the women gather, dressed in ceremonial Amazon gowns preparing for another engagement, Hippolyta tells her daughter that she does not want Diana to accompany them. She sees the questioning expression in her daughter’s face and explains that she had not taken the decision lightly and came to it after several long conversations with the Emissaries of Patriarch’s world. “It is time that the Amazons show themselves as more than mere extensions of ‘Wonder Woman'”. A nodding Mnemosyne adds that they had come to this world as teachers and they must present themselves as such. Diana protests that she is also a teacher – a seeker and exponent of peace and truth, the same as them. 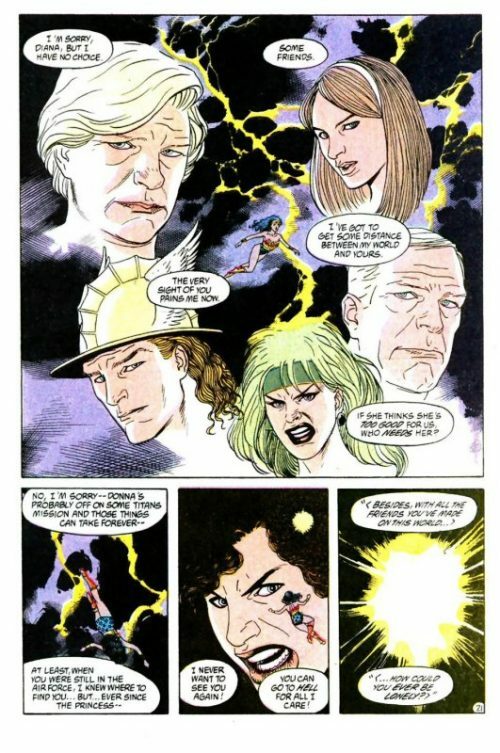 Hippolyta agrees but adds that to the mortals of this world Diana is far more. To them she is a warrior – what they call a “super hero”. 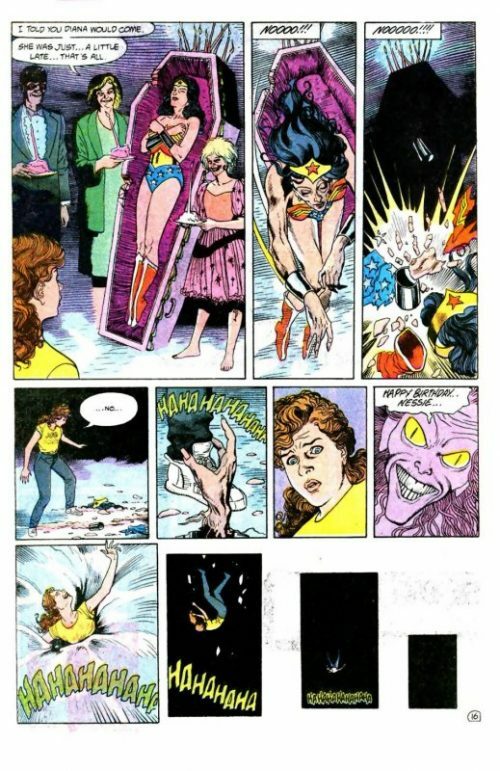 Hippolyta continues that she was under the impression Diana had personal matters to attend to, like Vanessa’s birthday? And was not Lord Hermes still in need of her support? Diana replies that indeed the God does, but she doubts he wishes to see her at the moment. She then suggests that perhaps if Menalippe accompanied her things might be different, but Hippolyta states that the Oracle already has her duties to perform in this troubled world. As do they all. As does Diana. An aide announces that their limousine is waiting outside and as the other Amazons depart, Hippolyta takes her daughter’s arms and asks her not to look so disappointed. Diana replies “How can I help it?”, adding that she will feel so lonely. it is as if her mother wants Diana to be away from her. The Queen tells her that she is talking nonsense and that keeping a lower profile is simply less contentious. She adds that they will see each other again before too long and besides, with all the friends Diana has made in this world – how could she ever be lonely? A short while later Diana travels through the Chaos portal back towards Paradise Island and her mind is filled with images of the people she knows and loves, all rejecting her in their own way. Julia…Eileen…Hermes…Steve…and of course Vanessa. Diana’s attempts to contact Donna Troy had also proved futile when Terry had explained how she was currently was away on a Titan’s mission. That night on Themyscira, Cydippe sees Myrrha standing outside the Royal Chambers and Myrrha gestures for her to keep quiet or else she will “awaken the Princess”. A puzzled Cydippe peers inside the room to see a sleeping Diana with her back to them and Myrrha surmises that Diana must have arrived during the night. Cydippe asks why Diana has returned home alone and Myrrha says she does not know. Although curiosity overwhelms her, she could not bring herself to wake the Princess in order to find out. Cydippe suggests that Diana must have been too exhausted not to have announced her arrival. She then asks what had brought Myrrha to the chamber in the first place. Myrrha replies that she thought she had heard the sound of crying.